While working hard can help you make more money, you don’t always need to work harder. Sometimes, you can get more done, and boost your income, by working smarter. 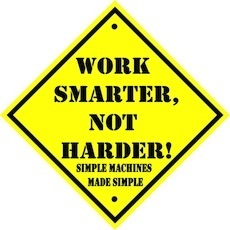 One of the best ways to work smart is to know when you’re most productive. For me, the morning hours are more productive. I’m able to get a lot more done. Pay attention to how you work, and when you get the most done. Once you pinpoint when you are most productive, do your most important projects then. Make it a point to do as much as you can during that time period. You might be surprised to learn that, according to a recent study, concentrated effort for four hours can be one of the most effective ways to be productive. Identify the four hours a day that you are most likely to productive, and then focus your energy at that time period to get more done. One of the best things I did was to outsource some of my social media tasks. You can hire a virtual assistant to take care of the mundane tasks that are part of your day. While you might have to pay someone to do these tasks, think about how much more you could make if you could spend that time focusing on the more important tasks. The cost of paying a virtual assistant is much less than what I can make in an hour, and that’s an hour of my day that I’m not doing social media stuff. Instead, I’m doing something I enjoy. The work gets done, and I’m earning more than when I was doing it myself. Rather than getting stuck in the tedium of administrative work, consider what you can delegate to someone else. The work still gets done, but you are able to concentrate more on growing your wealth, and improving your business. It can be hard to say no, but sometimes it’s what you need to do to stay on track. Whether it’s doing something extra for a project, or whether it’s taking on another client, or doing one more volunteer activity, sometimes you need to say no. Learn how to say no, and you can focus on the things that are most important for you. While you don’t always want to be saying no to projects, it can help to occasionally say no so that you can attend to more profitable matters. Multitasking really isn’t the best way to work smarter. In fact, it might actually lead to you working much harder, instead of working smarter. Studies indicate that multitasking is counter-productive. If you want to get more done in less time — and with less effort — stop trying to do more than one thing at a time. Instead, prioritize your to-do list, focusing on the most important items first. Focus on that one thing at a time, giving it your full attention. You’ll finish faster, and be ready to move on to the next task. If you prioritize ahead of time, you’ll get the most important/profitable items done first. Combine your priorities with the time of the day when you are most productive, and you might surprise yourself with how quickly and easily you accomplish more. The ultimate way to work smarter rather than harder is to take advantage of networking opportunities. Who you know really matters. While you don’t want to spend all your time schmoozing, the reality is that taking the time to get to know the right people can be helpful in providing access to better opportunities. The boss is more likely to promote the person he or she is most comfortable with. You can have the inside track on new openings in other companies when you network. Additionally, being connected can give you an idea of when to ask for a raise, and what actions you can take to improve your performance reviews. With a little planning and effort, it’s possible to re-arrange your work time so that you are working smarter instead of breaking your back by working harder. These are all great tips! Running our own business, we’re always looking for ways to streamline what we’re doing so we’re working smarter and overworking ourselves. That’s part of the reason why we’re always up at the crack of dawn so we can get as much as we can done before our kids wake up and need our attention.